To enter forum competitions you must be a registered member of HabboxForum. You do not need to be registered on Habbox for Twitter competitions unless stated. 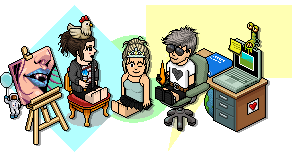 Habbox is giving all its members (including Habbox staff) the opportunity to enter competitions. You can send in your entry until the competition has been moved into the "Competitions that have ended" sub-forum, see the date in the title for an indication to when this change will occur. Members are only allowed to enter once per Internet Protocol Address unless the competition clearly states multiple entries are permitted; breach of this rule may consider in a temporary or permanent ban from entering Habbox's competitions. The winner(s) will be contacted via private message. Habbox have the right to close competitions at any time before the competition ending date and the winner will be judged from all the entries received up to that point. Any harassment, posting of multiple entries or attempted bribery of the judge(s) will get you disqualified and could get you into trouble on the forum. Competitions management reserve the right to change a competition winner for any reason with good grounds. Any entries that break the forum rules in any way will also be withdrawn. Prizes are subject to change and must be claimed within two months of the winner(s) being announced. Unclaimed prizes will be considered a donation to Habbox Competitions in the winner's name. All furniture and credit prizes will be handed over on Habbo.com only. All rights reserved. When posting in the competition forum, please refrain from having conversations. 1-2 posts interacting with other posters is acceptable, if relevant.Do not post questions about the competition. If you need to ask a question or feel it necessary to give feedback then please send a message to Competitions Management - Currently YellowBelli. Last edited by YellowBelli; 01-07-2018 at 06:37 AM.